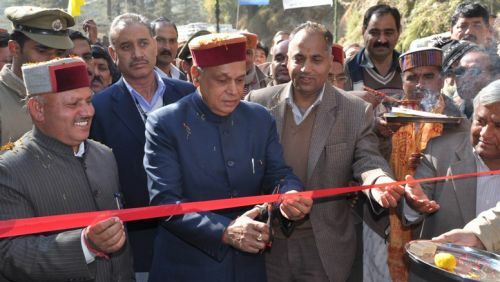 Chief Minister Prem Kumar Dhumal inaugurated 21 kms., long Chhatri Gada Gushaini Road in Mandi district that is completed at Rs. 2.78cr and motorable bridge at Rana Bagh, completed at a cost of Rs. 1.30 crore. 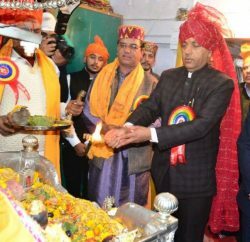 While addressing the public at Chhatri, Chief Minister claimed that in his Government tenure 37 Gram Panchayat of Mandi district had been connected with the motorable during last four years. Chief Minister said that Rs. 232 crore had been spent in district Mandi under NABARD and World Bank funding to construct roads and Chachiot assembly segment of the district has also got priority in it. He said that out of 690 kms., new roads constructed in the district 176 kms., of new roads were in Chachiot. He said that 410 kms., of road had been mettled and 780 kms., of roads had been renewed. He said that road connectivity had been on the priority agenda of the State Government. 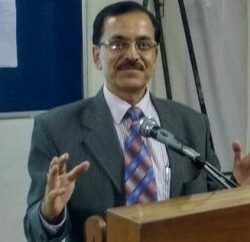 He said that to give boost to tourism in the area, it would be connected with Manali by creating another tourism circuit. He said that Tehsildar Thunag would be sitting in Chhatri to dispose off revenue work in the area in last week of the month regularly. He said that field level functionaries had been directed to remain available to the public on working days, especially patwaris, panchayat secretaries and panchayat sahayaks. Chief Minister said that the State Government was providing Rs, 316 crore to the consumers as subsidy during current financial year which included Rs. 166 crore on providing domestic power consumer electricity at cheap rates and subsidised essential commodities to the ration card holders where Rs. 150 crore were being spent. He said that the State Government had spent Rs. 65 crore on providing four CFL bulbs free of cost to each domestic electricity consumer under Atal Bijli Bachat Yojna. He said that there were a large number of other schemes which had benefited every family in the State. Rural Development and Panchayati Raj Minister Jai Ram Thakur welcomed the Chief Minister and thanked him for adding two more developmental milestones in the history of the far flung area of district Mandi. He said that with the inauguration of Chhatri- Gada Gushaini road, a long pending demand of the people had been fulfilled. He said that over 500 kms., of road had been constructed in the segment under BJP regime in the State. He said that soon Chhatri would also be connected with Janjehali via Magru Gala by spending Rs. 2.75 crore over the road project under execution. He said that Chhatri-Gada Gushaini road would reduce distance between Chhatri and Mandi by over 45 kms. MLA Karsog Hira Lal, also spoke on the occasion and detailed the works undertaken in the area in last four years. Kishori Lal, MLA, Ani, lauded the uniform and balanced development of Government in the State. P.L.Gupta, President, BJP Mandal, Karsog, Hem Raj Verma, President, Seraj BJP Mandal, Hukam Chand Thakur, Chairman, Panchayat Samiti, Karsog, Devesh Kumar, DC, Mandi, P.D.Prasad, SP Mandi, R.C. Verma, Chief Engineer, PWD Central Zone, Rajni Thakur, President, Mahila Mandal, Janjehli, Ritu Sharma, Pradhan, Gram Panchayat, Chhatri, other senior officers and prominent people of the area were present on the occasion.